If you’re looking for streaming the on-demand services on your TV, there’s no shortage of set-top boxes and streaming sticks around. In fact, the electronics world has got smart and you’d encounter a number of smart on-demand streaming devices in the market. 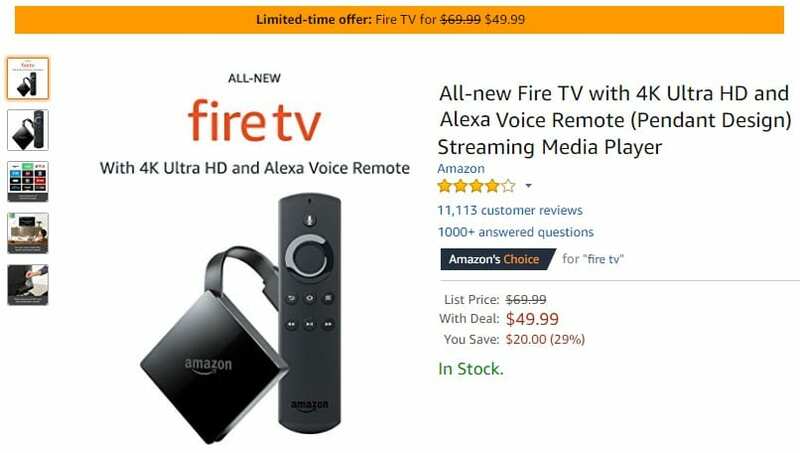 But if you want Alexa to be your smart assistant, then the Amazon Fire TV and the Amazon Fire TV Stick are probably the best devices you’d get currently. And what if I tell you, you’d have to pay much lesser for the devices if you get them today? Yes, Amazon has slashed the prices of the Fire TV Stick and the Fire TV with 4K Ultra HD. Check them out! The Amazon Fire TV Stick is the budget-friendly device that can stream content to your TV from your mobile device. The device usually costs $39.99, but thanks to Amazon’s 25% discount, it currently costs only $29.99. Despite the low price, you still get the Alexa voice remote control which allows you to request shows and other content. For instance, you can simply say, “Play Game of Thrones” or “Launch Netflix” and Alexa will respond instantly. 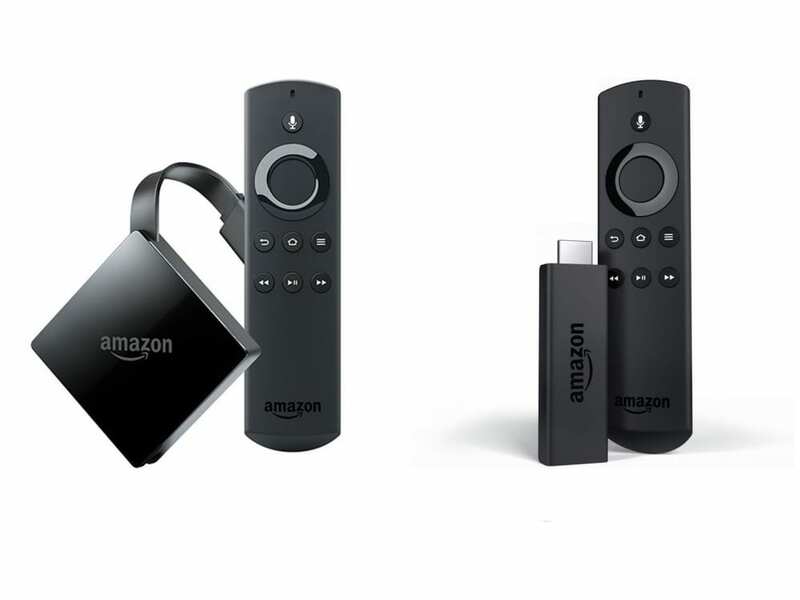 With Amazon Fire TV Stick, you never miss out on any shows. Wherever you travel, you carry all the hit shows and movies with you and pick them up where you left off. Just plug the Fire TV Stick into any TV’s HDMI port, connect to Wi-Fi, and continue streaming. With the all-new Amazon Fire TV, you get to experience a whole different level of entertaintment on your TV. You can watch your favorite movies and TV shows in ultra high-definition. Not only do you get Ultra HD resolution, but you also have HDR support. If your TV supports both, you’ll be able to get better-quality video with improved colors and dynamic range. Of course, there is Alexa too. The device has a usual price of $69.99, but for the moment Amazon has it listed for $49.99. 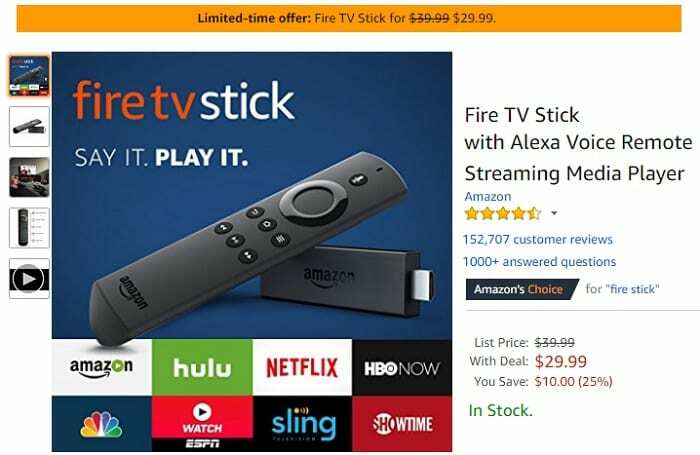 At this price, you get everything that you’d get with the $30 priced Amazon Fire TV Stick. Furthermore, you get to experience true-to-life picture quality and sound with access to vivid 4K Ultra HD up to 60 fps, HDR, and Dolby Atmos audio. It also includes a quad-core 1.5 GHz processor, which Amazon says is 40-percent more powerful than what you’ll find in the Fire TV Stick. The Fire TV 4K also has support for home automation control. You can voice control your Wemo smart plugs, Hue lights, a Nest thermostat, or Amazon’s own Cloud Cam security camera, through the Fire TV 4K. There’s no news as to when both discounts will last, but presumably, not for much long. So you better grab the deal now! Click on the links below and head on to Amazon straight away. Next articleGalaxy S9 vs Galaxy S8: Should you upgrade to Samsung’s latest flagship?